Just a quick note here to thank you for reading this blog. The past two posts received quite a little bit of traffic. “Chasing Squirrels,” the tribute to my little buddy Jack Dog has received more web hits and unique visitors than anything I’ve written in this space. Jackers would be proud. So I am. The post earlier this week with the news on Mike McCaffrey’s forfeited amateur status, which vacated his Texas Mid-Amateur championship and U.S. Mid-Amateur medalist and quarterfinalist honors, also caught the attention of many readers. Both posts garnered several reader comments, as well. I tried to figure out how to respond directly to each reader who made a comment. Alas, I am not that savvy. So this post is my way of saying “thank you” to everyone who has taken time from their busy schedules to read this blog. I have special appreciation to everyone who took time to comment, too. It is greatly appreciated. I’m especially thankful for all the kind words that were written in regards to the loss the Jack Dog. Many of the posts were made anonymously, but some were not. So thank you, Faith, Sarah, Matt, Sharon, Neil, Liss, Susan and Kristi. Your words were comforting, as is the realization that many of you have also gone through the heartache of losing one of your best friends. There is comfort in that. The comment section for the McCaffrey story ran the spectrum of disbelief, outrage, anger, support and empathy. I’m happy to have helped provide a small venue for others to share their opinions on a controversial topic. I hope you’ll continue to read this blog and comment with your opinions. This morning I said good-bye to my best friend. ﻿Jack Dog was a 15-year-old Welsh Corgi mix and the most loyal, loving friend a guy like me could ever hope to know. I’m going to miss him eternally, but I know he’s happy right now. 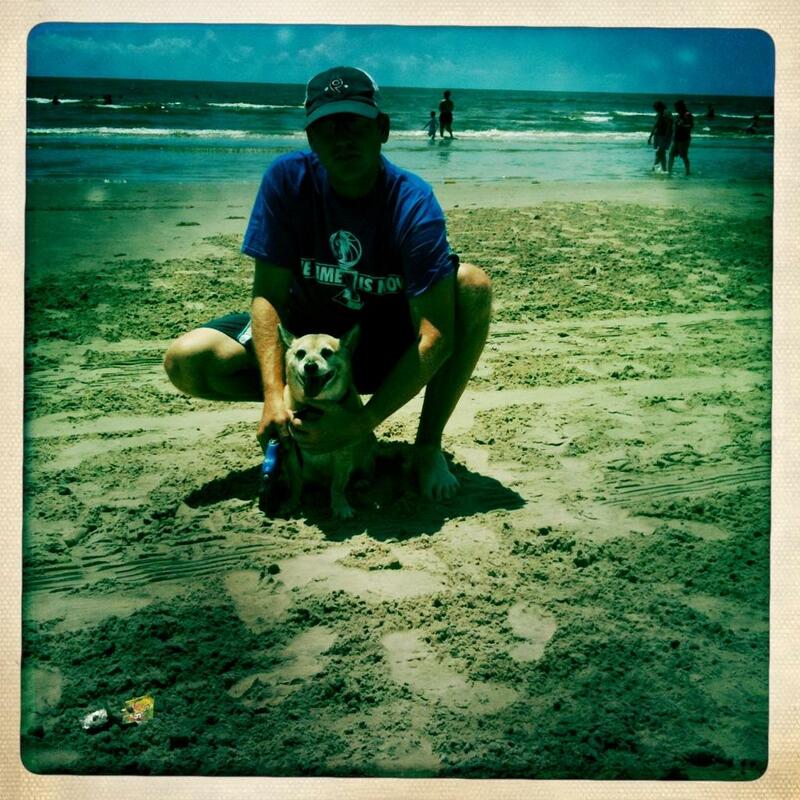 He’s pain-free, running fast and breathing easy in heaven. the amazing things about him. ﻿That makes me feel good. ﻿﻿I can promise you right now he’s up there begging my grandpa for table scraps. Jack never begged with a whiny whimper like so many other dogs I’ve known. No, not Jack. There are a couple golf connections to the Jack Dog, also known as Jackson, Jackers, Jackaroni, Macaroni and Jackson-Roni among many others. Back in 2001-03, we lived with my good friend Robert in an apartment near downtown Atlanta. It was just off Peachtree Street and right across from a run-down municipal track called Bobby Jones Golf Course. Robert and I had some battles on that old course. It was short, hilly and never in great shape. But I loved it and always will. The 15th green was just across the street from us. I used to take Jack for walks on the course, and he loved, loved, loooved chasing squirrels there. In his prime, Jack was Deion Sanders fast with Barry Sanders-like agility. He could jump a foot off the ground. If he didn’t want to be caught, well, you weren’t going to catch him. ﻿﻿I’d walk Jack over on Bobby Jones at night, too. When the moon was bright, I’d take a wedge and a few balls and chip on the 15th green while Jack wandered around, looking for brave late night squirrels. One of his absolute favorite things to do was run at full speed on the 15th green and hurl himself over the lip of the greenside bunker and belly-flop down into the soft sand. He’d run around in circles, kicking up sand everywhere. Then he’d come back to the green and do it again. And again. The maintenance crew must have loved it. Jack with Abby Ling and my mom. ﻿﻿﻿When Jack first came into my life back in 1999, I was on a golf hiatus. I took a job writing sports for the newspaper in Corpus Christi. It was so windy down there—and my normal ball flight was a 30-yard slice—that I quit playing for three years. At work I met a great guy named Dan, who taught me how to surf. Dan is the best surfer I’ve ever known. He can rip. We became great friends and I ended up moving into the downstairs portion of Dan’s house on Port Aransas Island. We lived two blocks from the beach, and Dan’s house on East Street had a yard in front and back (Dan still lives there today, along with his beautiful surfer wife Michelle and their amazing son Zach). One of my beats back then was covering the minor-league hockey team that had just come to town. If it wasn’t for that hockey team, I would have never met Jack. At every home game, I sat in the press box next to a friendly and generous man named Rick Dames. He owned the radio station that broadcasted the games, and he usually did the radio color commentary. One night I told Rick that I moved out to Port A. I was pretty excited about it. “Now that I have a yard, I can finally get a dog,” I told Rick. ﻿﻿About two weeks later, Rick called me. I didn’t know it, but his wife was on the board of directors for the local Humane Society. Rick said they had this great 2-year-old Corgi he thought would be perfect for me. Thirteen years later, and letting him go for good this morning was the hardest thing I’ve ever done. Jack was a great dog. A great friend. Some of you reading this got to know him well. This summer, he made a new friend named Bozley. Jack’s circle of friends cast as wide as mine: Peyton, Abby Ling, Jasper Puddles, Divot, Buddy, Lucy, Manny, Apollo, Pritzi, Ollie, Walter, Sadie, Kate, Dusty, Peanut, Charlie and Oreo were just some of them. Jack at Galveston Island this summer. His last trip to the beach. ﻿Like his owner, Jack wasn’t the most social guy. But when he met someone he really liked, he latched on pretty tightly. I’m just lucky that he latched on to me the tightest. You should have seen Jack follow Bozley around like a shadow this summer. Peas in a pod. ﻿﻿﻿I wanted to write about Jack today because I’m not sure what else to do. I’m sitting here at my home office and everything is quiet. Way too quiet. It is way too damn quiet in here right now. I’m used to hearing Jack’s cough or his Kansas Jayhawks collar jingle when he shook himself after a good nap. My vet, a kind doctor named Susan, told me I’d probably hear Jack’s echoes in my home for a while. I’ll hear his collar, she said. I’ll hear his cough. 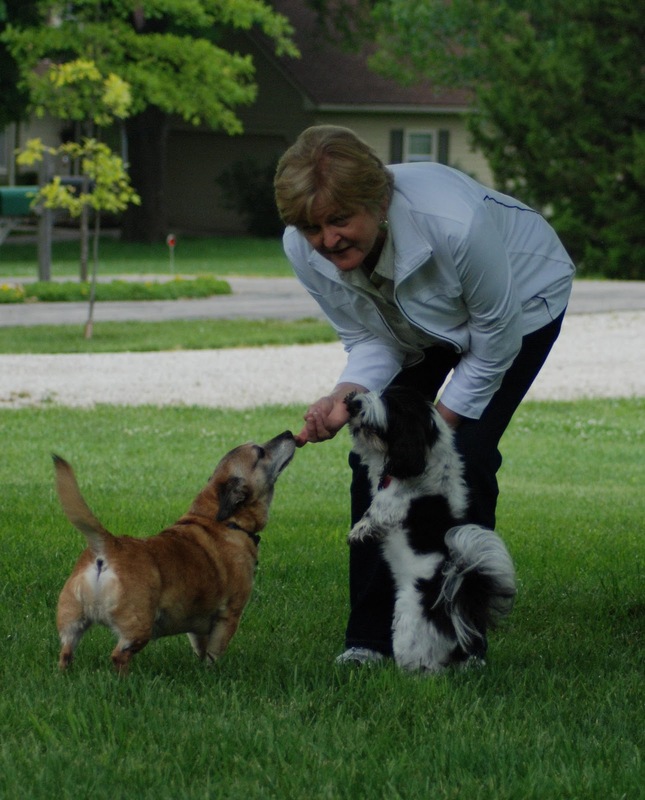 After so much time together, Susan said people often hear their pets for a while after they are gone. I don’t hear Jack right now. I hope I do soon. I know he’s happy, and I hope he’s thankful for the life and love I gave him. He gave me 13 wonderful years of friendship, loyalty and unconditional love. What else is there in life? I’m going to remember the good times. I’m going to remember him chasing squirrels and kicking up sand. I’m going to celebrate his life. At some point in the not-too-distant future, I’m going to get another dog. My favorite band plays a song with the following lyrics: Sometimes a dog is as good as any man. In Jack’s case, he was often better. Rest in Peace, Jack. You were a great friend. The best. You will be missed and never forgotten. Note: This article appears in the October issues of DFW Links and Houston Links magazines. ’Tis the season to don your colors. No, this isn’t a column about your favorite college football team. The colors in question here are the red, white and blue of the American flag. The victorious U.S. Team at the 2009 Solheim Cup. 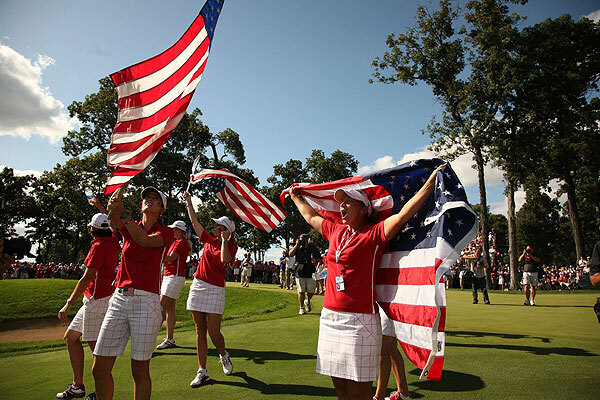 Starting last month and running through November, patriotism continues to be on high in the golf world. With apologies to the contrived FedEx Cup Playoffs, international team golf has taken center stage with the playing of the Walker Cup and Solheim Cup last month and the Presidents Cup looming in November. The pageantry of individuals playing as teams from their countries will soon touch Texas, too. The sixth playing of The Spirit International starts Nov. 2 at Whispering Pines Golf Club in Trinity. In one of the most unique formats in all of golf competition, teams consisting of two men, two women and a coach from 20 countries will vie for gold medals in five events played through 72 holes of best ball format. If you’ve never been to Whispering Pines, this is the perfect opportunity. Admission is free, the golf is superb and the competitive passion is contagious. There’s something special about golf events played in team formats. Maybe it’s because golf is such an individual game. Other than one’s caddie, golfers rely solely on themselves for success. So many of our other favorite sports allow for teamwork—a key block in football, a timely pass in basketball—and it underscores how unique and difficult golf is. It’s just you, the golf ball and the course. When you add in patriotism and playing for an entire country to the team format in golf, the results are extraordinary. 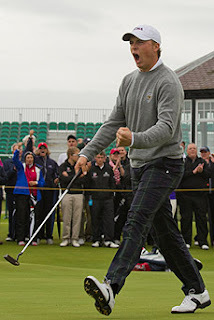 match at the Walker Cup in September. Look at the photo of Jordan Spieth on page 43. It really says everything about playing on a team for your country. The emotion is raw, genuine and unadulterated. Spieth, as an example, has played golf on the highest levels. He’s played on the PGA Tour. He’s won USGA national championships. He’ll also be the first to tell you that playing for his country means more to him than any of it. It showed in September during the Walker Cup. Spieth was the only U.S. Team member to post an undefeated record (2-0-1) in Great Britain & Ireland’s 14-12 victory. During the weekend of the Solheim Cup, I woke by 6 o’clock each morning, rolled out to the couch and flipped on the telecast from Ireland. One of my favorite things in the world is waking early on the weekend for international team golf played across the ocean—namely the Ryder Cup every two years. This year’s Solheim Cup was equally as thrilling. I rooted hard for LPGA Tour rookie Ryan O’Toole, who was a controversial pick by U.S. captain Rosie Jones. Like Spieth at the Walker Cup, O’Toole finished undefeated (2-0-2) and was one of the bright spots for America. Even though Europe rallied to win back the Solheim Cup for the first time since 2003, it was compelling TV. Watching players like Christina Kim, Paula Creamer and Michelle Wie show so much emotion was a joy to watch. Maybe that’s why I love these international competitions so much. It’s really the only time in golf (outside of winning a major, I suppose) when it’s acceptable for players to go over the top with fist pumps and tree-rattling screams after making a clutch putt. You just don’t see that kind of emotion in other events. I’m looking forward to witnessing firsthand that kind of passion at The Spirit International next month. With the Ryder Cup, Walker Cup and Solheim Cup all resting in the hands of the Europeans, The Spirit is the next chance for the U.S. to win one for the red, white and blue.